“8k Marathon” is an attempt to generate social awareness. This initiative by ‘BrandLand’ wishes to create awareness on the importance of Running to prevent Health Issues. 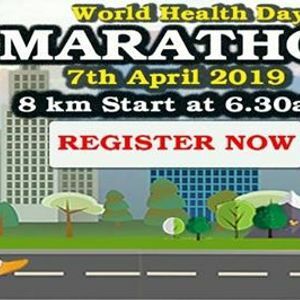 This event will witness over 5000 people Running from the Inorbit Mall, Rd Number 7, EPIP Zone, Whitefield, Bangalore for about 8 km Marathon – to raise awareness for family’s support and prevent, manage and reduce the risk of different typies of health problems on World Health Day. Join in and Run for healthy and happy family. Let your team join feet with BrandLand for this great social cause. This Run marks a day to raise awareness about Health and show your support for the more than 900 million people currently living with different typies of health issues and the many more at risk. And no matter how frightening, annoying, and frustrating it can be, people with health problems can live long and happy lives with proper treatment. A walk or a run that brings together the entire family to run for a prime cause. Inorbit Mall, Rd Number 7, EPIP Zone, Whitefield, Bengaluru, Karnataka 560066. 8 km run/walk – ₹ 549 per participant. In Children Only 1 participants with the best timing will win prize. In adults Women Only 1 participants with the best timing will win prize. In adults Men Only 1 participants with the best timing will win prize. In senior citizen Only 1 participants with the best timing will win prize. Reporting time: 6:00 AM sharp. Start time: 6:30 AM sharp. Kindly report 15 minutes before. No baggage counter will be available at the venue. Bibs will need to be collected before the walk. Certificates, medals and breakfast may be collected once the walk/Run is completed. When registering for more than one participant, their individual details i.e. name, email and contact and number need to be shared. No refund will be issued on entry fees. For refund requests a week prior to the event, 10% will be deducted from the registration fee.